I don't think she's got the longest name in the world, but Dido Florian Cloud De Bounevialle O'Malley Armstrong, which you'd recognise by her first name has got a great angel-like voice. That's been a long time since we heard from this singer and I was very excited by the opportunity to listen that voice again in her fourth release Girl Who Got Away. 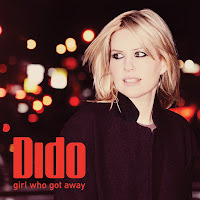 After achieving world wide fame due to her debut No Angel (1999), which led to winning the prizes of BRIT and MTV Europe, Dido made two more albums and recorded one live concert at Brixton Academy, which shows how talented she is. I don't know a lot of artists who sounds the same either at the studio and the stage, but I'm sure that Dido is one of them. The new album is ears-pleasing as usual, but suffers from heterogeneity of songs. Some of them sounds great, others you'd rather to fast forward. Dido keeps singing with the same passion as in her earlier releases, she's dedicating herself to every word she sings, but sometimes it seems that the lyrics downgrading her vocal skills. Still, this album is well produced and nice to have in your own discography for late starless nights. Three of the best songs in her latest release are waiting for you below with two other from the past.